Plans for National Poetry Day? This Thursday, October 8th! National Poetry Day is nearly upon us! Thought I’d be a bit poetry-festive and make a day of it. plus I’ll be keep an eye on Twitter, I’m sure there’ll be more suggestions on the day! 12:00pm: Lunch! Is there somewhere poetry-themed I can eat? The Blind Poet? Tips welcome! Might peruse the Book Week Scotland schedule on my break & book in for some poetry events? Definitely looking forward to seeing who wins the Big Words Edinburgh competition! Will head out and see if I can find the Scottish Poetry Library’s poetry postcards around town. 5:00pm: Pass the time on my bus ride home with poetry apps (as usual?) – my go-to is the Poetry Foundation app which is available offline as well. Poetry Daily has a good app too. Poetry in your pocket all the time! 6:00pm: Poetry over dinner? I haven’t checked out the BBC’s Contains Strong Language, but looks like lots of great shows to choose from! 10:00pm: Poetry before bed! Will read from the bedside table pile until I zonk. 10:30-11:30: Poetry and Coffee at Hendersons in the morning. Have a fun and poetry-filled day! Quotables – National Poetry Day 2010! Happy National Poetry Day! Hopefully I can manage to get this post out before the clock strikes. I was kindly asked by Laura Grace of Quotables fame to write a blog post with some of my favorite poetic quotes for their National Poetry Day blogathon. Please do go check it out here. Also for National Poetry Day, I headed over to the Scottish Poetry Library for their celebratory teaparty and poetry reading. Loads of folk were in attendance reading old favorites and new poems, as well as the poems from the SPL’s poetry postcards. It even ended with a song! I made the above-pictured cupcakes (photo care of marvelous Peggy! Thanks, P! 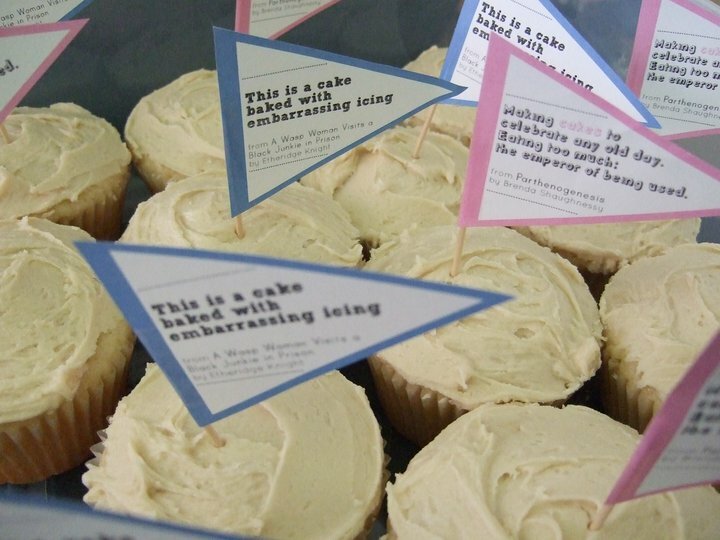 ), with wee poetry-flags with lines from a couple cake-talking poems I found online. This one, and this one. You can check out the gorgeous poetry postcards the SPL made this year, or even send one to your pals as an e-card! And if you head into the library this Saturday, I’ll be there volunteering with Kay so you can say hello and pick up some paper postcards too!